Suitable for the competent D.I.Yer, this self fit glue less air spa system is designed to be quick and easy to fit. This kit contains high quality brass air spa jets in polished chrome, these are designed to fit in the base of the bath and release the air bubbles up through your bath water. The controls are simple yet effective. A slim low profile pneumatic 3 speed On/Off switch in a polished chrome finish provides control to operate the blower. The low noise, non heated blower is discreet and offers exceptional performance and comes with a manufacturers warranty. Any electrical connections must be carried out by a qualified electrician in accordance with the current IEE and building regulations - An RCD must be fitted. 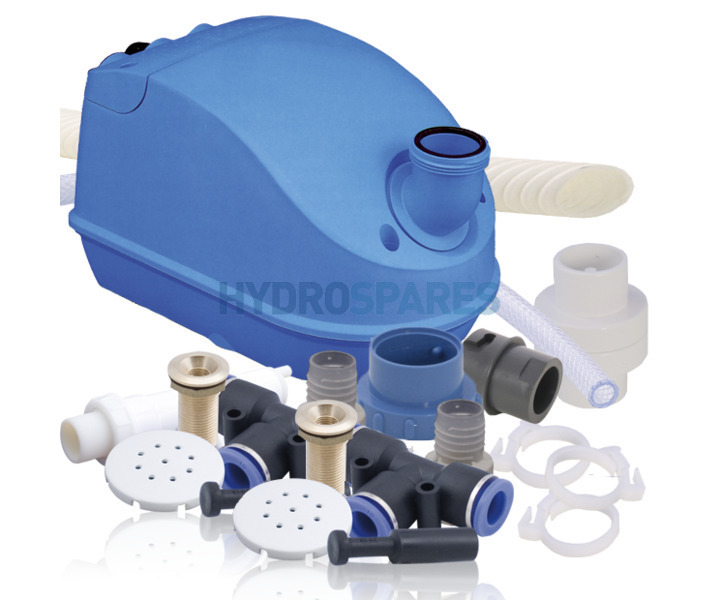 Please contact us here at Hydrospares for more information. Drill - Electric or battery with speed control preferably. 4mm drill bit (for the Pilot hole) and a 12mm tile cutter in order to make the 8 holes in the base of your bath!